After a long period of ill health, Deacon John Stuart of Dartmoor, died on 9 August, aged 71 years. John Howard Newton Stuart was born on 5 June 1947 in the small historic market town of Howden in the East Riding of Yorkshire, close to the home of his maternal grandfather, Fred Wright, who owned Hemingbrough Hall 1938-1952. When, less than a year old, his father took the family to Southern Rhodesia (now Zimbabwe) and later establishing a printing business in Northern Rhodesia (now Zambia). John attended a boarding school in Southern Rhodesia and, on leaving school became a photographer with the Northern News, Northern Rhodesia’s daily paper. He also trained as a film cameraman and moved back to Southern Rhodesia when television broadcasting began in 1960. Whilst he was doing his military national service, John’s father died and he returned to England with his mother, as his younger brother was at sea as a cadet. He studied his A-levels at the former Taunton Technical College, from where he went to Hull University with the intention to read Divinity & Politics, but didn’t settle to academic life there, so joined the army instead. This coincided with his mother having joined the WRVS and being posted to Hong Kong. After commissioning he was posted to the Gulf to join the 200 Hovercraft Squadron, Royal Corps of Transport (RCT). Following Britain’s decision to withdraw from the Gulf, the Hovercraft Squadron was eventually disbanded and John was re-badged as an Infantry officer. At the end of engagements, mainly in Northern Ireland and Germany, he left the army, but returned to the Gulf, where he worked on several projects for the Ruler of Dubai. After this he returned to Britain and resumed his camera work, working for the Ministry of Defence, the BBC and other broadcasters. For a period he served as Head of Film at TSW (Television South West) and then Electronic News Gathering at TVam. He was the first national cameraman at Lockerbie in December 1988 when the Pan Am jumbo jet crashed with the death of 259 passengers on board and a further 11 casualties on the ground. After 1992 when the franchise ended, he worked as a freelance, during which period he married Amelie and their daughter, Lissi, was born. John’s background was certainly not that of a conventional clergyman, but his Christian faith had sustained him through his life, whilst his essential decency of character, and selfless kindness began to manifest themselves more as he matured with age. John now decided to resume his academic studies, which had been interrupted by his military career, so he started to read Theology at Exeter University, where he met Father Martin Lee, who not only had common academic interests, but also shared a military background. As part of his commitment to supporting those in need, John took up driving HGV lorries of aid to orphanages and missions in Roumania, which took him across the Carpathians in Moldova. Whilst abroad he began attending Orthodox church services, with which he felt profoundly at home. Through his friendship with Father Martin he began to learn about the mission and vision of the British Orthodox Church and was eventually received into the church and attached to Father Martin’s St. Mark & Archangel Michael Mission at Sidmouth. To support the mission he was first ordained as a Reader on 26 March 2000 and later as a Subdeacon on 23 July 2000, both at Sidmouth at the hands of Metropolitan Seraphim. He was finally ordained as a full Deacon on 10 February 2001 by Metropolitan Seraphim in the Chapel of St. Luke’s College, Exeter. The following year Amelie and Lissi wished to relocate to Berlin, so in August 2002 Deacon John bought a cottage at Wotter on the south western edge of Dartmoor, as a retreat to continue his local ministry, although he was a frequent visitor to Germany. In 2005 Father Martin retired from active church ministry on health grounds and the Sidmouth Mission was closed. After that Deacon John continued with the pastoral ministry he had developed whilst working as a part-time medic in local hospitals, but now was only able to attend the occasional liturgies celebrated by the British Orthodox Church at Glastonbury Abbey or make the longer journey to the Bournemouth Church. 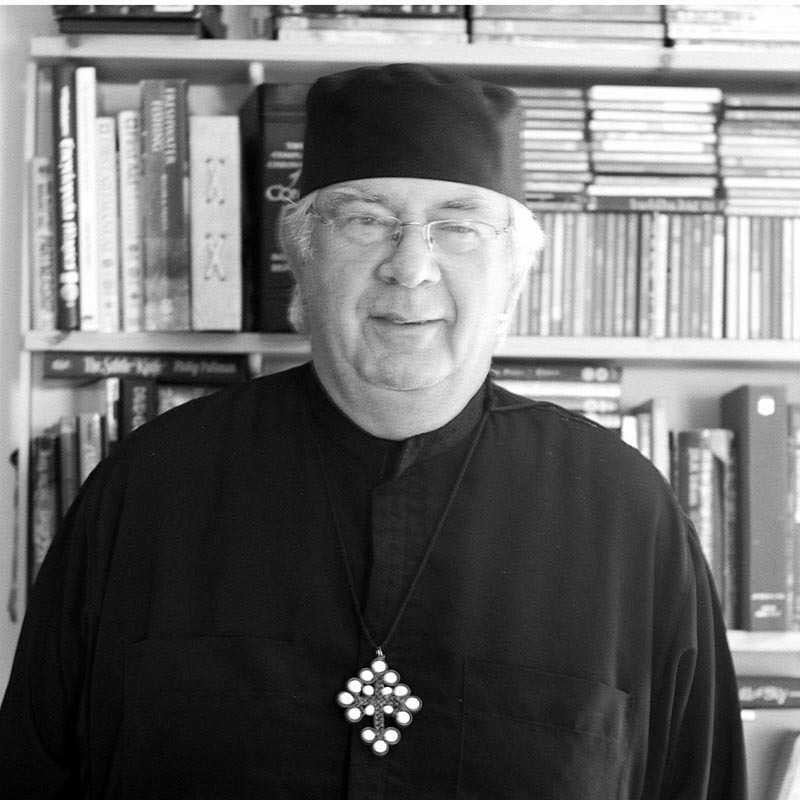 In November 2009 he suffered a slight stroke, which necessitated some restrictions on his activities although in 2012 he sought permission to work closer to home, serving as an Honorary Orthodox Chaplain within the NHS Plymouth Hospitals Chaplaincy team and in supporting his local Anglican clergy on Dartmoor in their pastoral ministry to local Christians, especially the sick and elderly. Although he was no longer able to officiate under the auspices of the British Orthodox Church, he insisted that he still regarded himself as one of Abba Seraphim’s deacons and was not prepared to align himself with those who, after 2015, decided not to support its renewed independence. His health, however, continued to steadily deteriorate and he spent much time convalescing in Berlin, where he was finally diagnosed with cancer of the stomach and leukemia. At the end of July, upon his return from Germany, where he had spent a long period receiving medical care, he telephoned Abba Seraphim from a hospital in Plymouth to advise him of his terminal condition and to seek his prayers. Deacon John’s genuine pastoral spirit and commitment to those in need, was a constant strength to all those to whom he ministered. His practical nature and personal warmth, combined with an impressive intellect, provided sound and solid support to all who sought it. Sadly, circumstances and his own health, limited the scope of his ministry, but among those few to whom he so freely offered his service, the benefits were significant and he truly manifested the earthly diaconal ministry of our Lord and Saviour, who went about doing good, for God was with him (Acts X: 38). Memory Eternal !